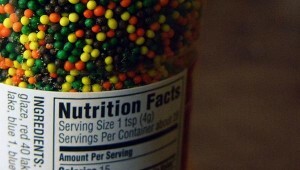 Do you always check the nutrition facts to see the calorie count? Credit: juliaeatssweaters. For not being into counting calories, we sure have talked a lot about them this week! From this insightful piece on how a calorie is NOT a calorie to this review on ultra dense NudeFood, we’ve been jabbering about calorie-this and calorie-that. And generally, we think calories are a good reference point. It’s good to know what you’re eating and exactly how much fuel it contains per serving size. Having that knowledge allows you to pick your serving size or even decide to eat one thing over another. So, while we don’t count them or get obsessive about them, it’s better to know than not know, we think. But what do YOU think? I hate counting calories so I decided to go Paleo. I love it! I know that 400 calories of Broccoli and 400 calories of crap are not that same. I also can eat as much as I want cause it’s good stuff. Strangely though I don’t end up overeating the way I did when I obsessed about calories! Who knew. I have been sick with severe bronchitis for the past 4 days and I’ve lost 7.5 pounds ! I am not counting calories, or exercising, but the only foods I can seem to keep down are the Joe’s Eat At Home Steam-able Meals, 2 slices of turkey bologna with 2 eggs over easy; that’s it ! I think it’s all about what you’re eating. Of course we care about the calories. It is true that in Europe we care food. And that’s called Mediterranean diet is very healthy. But age, sedentary lifestyle and stress that we do care for our diet extremely incur no risk of cardiovascular disease. I love eating and I hate counting how many calories are there in each food I eat really.But still I really care about my health. Actually, we all know Health is Wealth. But those who have something they really don’t care. We should ask those who are suffering from health issues. I think proper food really helps us to be healthy. Please take care of your health!